PDF is one of the most widely used file formats. It is popular because you can easily create complex PDF documents embedded with charts, images, tables, etc without spending a penny. Because of the complexity of PDF files, you cannot open them in a text editor. Many popular office suite software supports PDF files, but they provide limited features. For a better experience, you must use a special app called PDF reader. 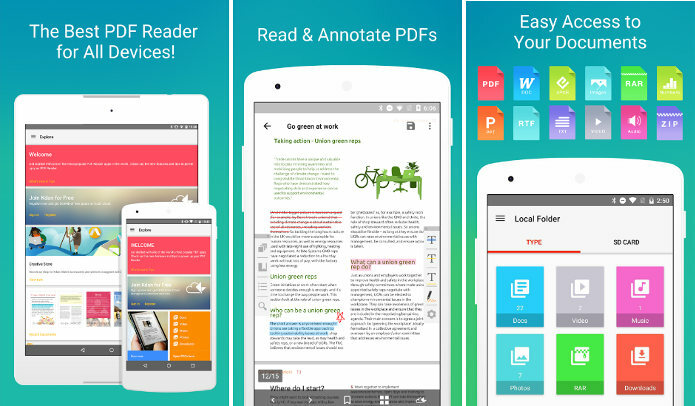 Below, we’ve shared the best PDF reader apps for Android devices. If you’re searching for an app to open PDF files, make sure you download and use one of the below applications. Adobe, the multinational software company had launched the first-ever PDF format file and a Windows software called Acrobat Reader in 1993. The software allowed users to read and edit PDF files. It is still being used by millions of people. Why this is so? Well, Adobe updates it on regular basis. AR offers several tools to make reading PDF files a pleasurable experience on desktops. Acrobat Reader is available for Android devices too. The mobile version of Adobe AR features a beautiful tabbed interface. 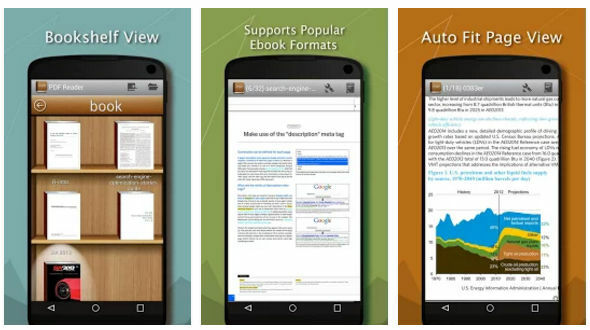 It has tabs that give you access to recently opened PDF files, documents saved on the storage memory of the Android device, etc. Adobe Acrobat reader supports Dropbox. If you’ve uploaded PDF files to your Dropbox account, you can edit them on your mobile device with the Acrobat reader. Adobe AR allows users to create a new PDF file online. It provides a search utility and has an option to prevent the phone’s display from turning off when you’re reading an eBook. The app allows users to print the camera’s output to a PDF file. Searching for a lightweight tool to read PDF documents? Install the free Google PDF viewer application. The app will not add a shortcut to the home screen after you install it. When you try to open a PDF file, Android OS will display a list of apps that will let you open the file. The list will contain Google PDF viewer utility. 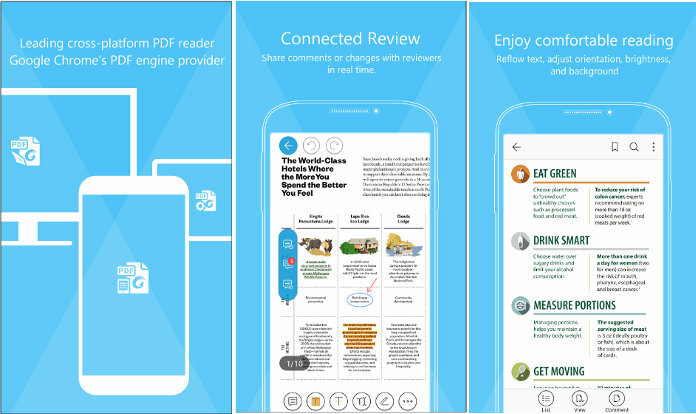 XODO is a free PDF reader app that ships with many features. It detects PDF files on your phone automatically and lists them on its main window. 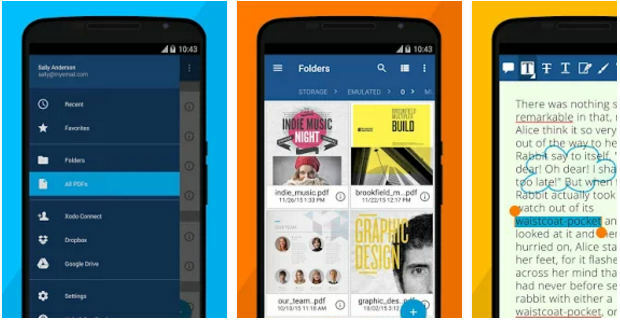 The app also displays the path where the file is stored. XODO enables you to filter PDF documents and sort them by their name or modification date. It also allows users to edit files saved on the phone’s storage memory or Google Drive, Dropbox, Microsoft OneDrive cloud storage services. 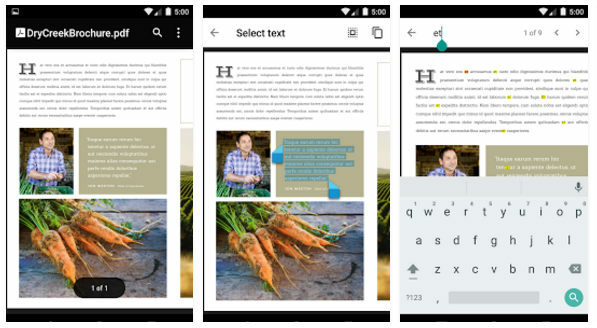 The app lets you bookmark and print PDF files. It offers a search tool. It supports five viewing and 16 color modes. XODO lets you make a copy of the edited file without changing the original one. The app lets you navigate to the different pages of the PDF document. It provides text to speech tool and has an option to enable night mode. The PDF reader allows you to find specific text on a page with its inbuilt search tool. It allows you to use custom fonts and has a utility to export the list of bookmarked files to a text file. Apart from the PDF format, this app allows you to open RTF, EPUB, DJVU, XPS format files. Foxit has 1+ million users. It has a nice user interface and numerous features. The Foxit application lets you open/edit PDF files. It provides three reading modes – continuous, single, and thumbnail. It adjusts display brightness automatically when you’re reading a PDF file. The app includes a color chooser tool which users can use to change the background color of a PDF document. It has an option to enable night mode and transfer files. It enables users to navigate to a specific page of a document. The free app from Kdan enables users to manage PDF files stored on their devices efficiently. It has a beautiful interface. It ships with a file explorer tool that allows you to locate files quickly. The PDF reader has a document scanner tool through which users can create documents from images. It includes a page jump tool which users can use to open their favorites pages quickly. The app lets users scroll pages horizontally or vertically. It has an option to highlight all hyperlinks embedded in the document. Conclusion: PDF Reader is a must-have app for Android devices. If you don’t install it, you won’t be able to read PDF format eBooks and files. The applications we’ve shared above have a great interface and several features. Some of them support formats other than PDF. I think the best PDF Reader for Android is Lirbi Reader, it’s the best for reading books. Only it support custom background color, text to speech, lock the document, bookmarks and so on.